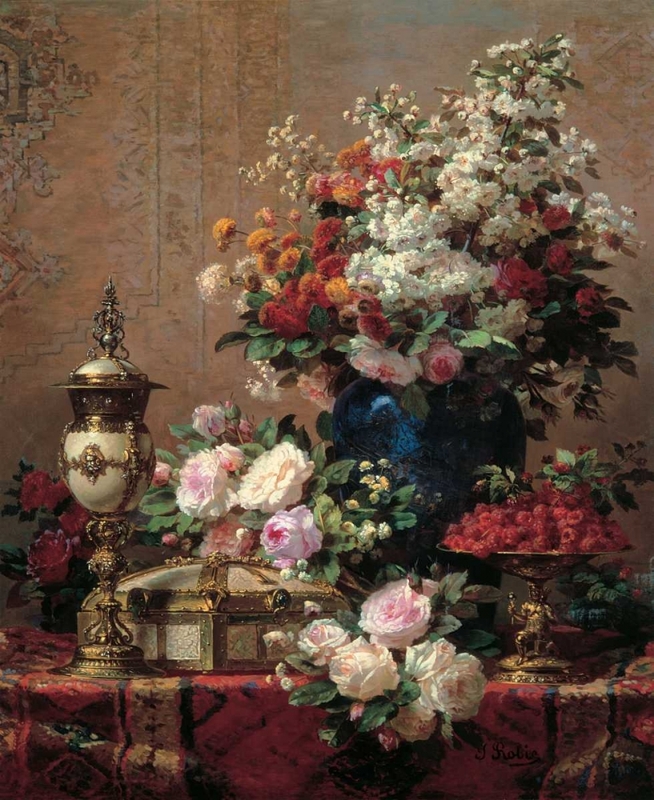 "Jean Baptiste Robie was born in 1821 and was known as a writer, a traveller and, above all, as a painter of beautiful floral still lifes.Robie grew up in Brussels, where the art world was still influenced by the work of Jacques Louis David, who had fled to Brussels from France following the Revolution. In his early years, Robie painted portraits of Napoleon for British visitors, principally as mementoes of the Battle of Waterloo. 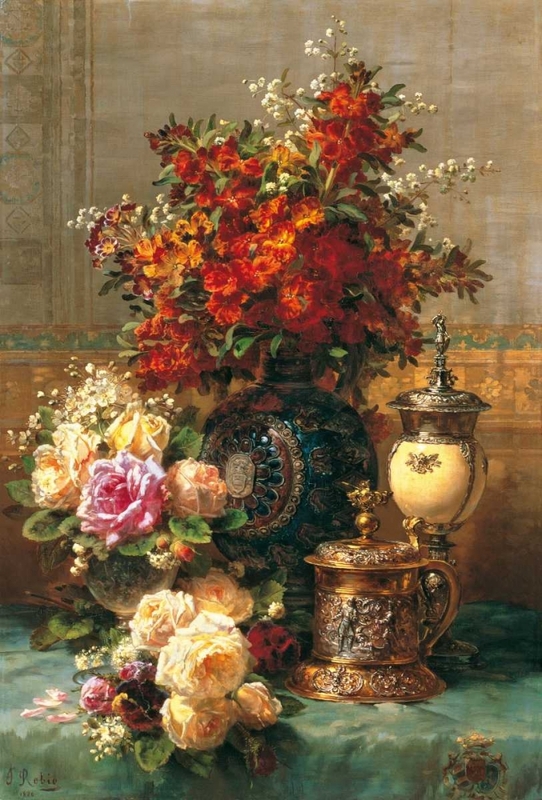 However, he soon turned to the painting of still lifes and became the most successful painter of his generation in this genre.Robie's paintings are distinguished by his faithful use of colour, his clarity and the use of perfectly painted accoutrements, including candlesticks, silver bowls and jugs.Robie exhibited at the Brussels Salon between 1843 and 1875 and was regularly honoured by the Belgian nation. He was made a Chevalier de la Legion d'Honneur and a Commander of the Order of Leopold. 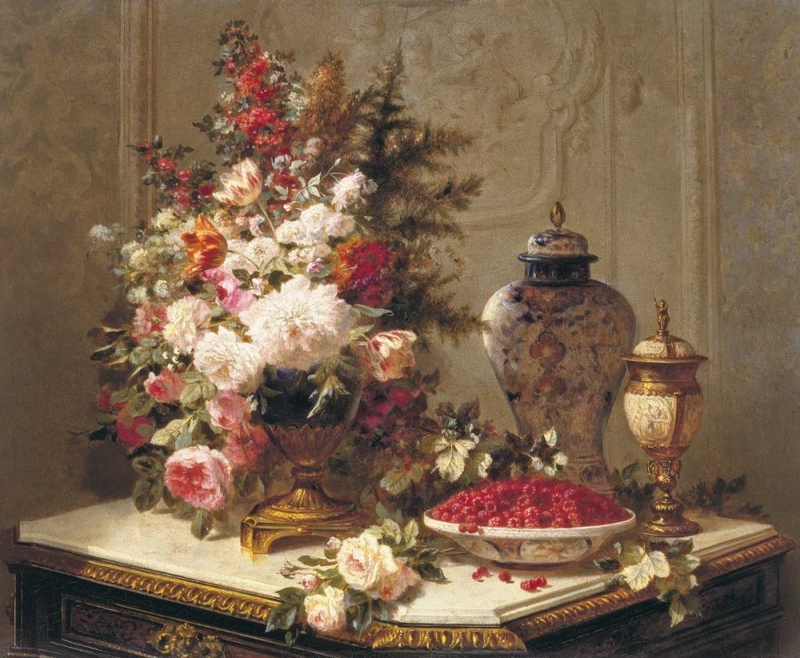 He travelled widely, visiting Egypt, Syria, Spain, Italy and England, and he exhibited at the Royal Academy in 1875.Robie wrote a number of travel books about his tours and died in 1910."